Yesterday I shared with you my book club's thoughts about our November read THE GIRL IN THE CASTLE by Santa Montefiore, the first book in the Deverill Chronicles. Today, I thought I'd share mine. For the most part, I agreed with my friends; however, there were a few things that stood out to me about the book. 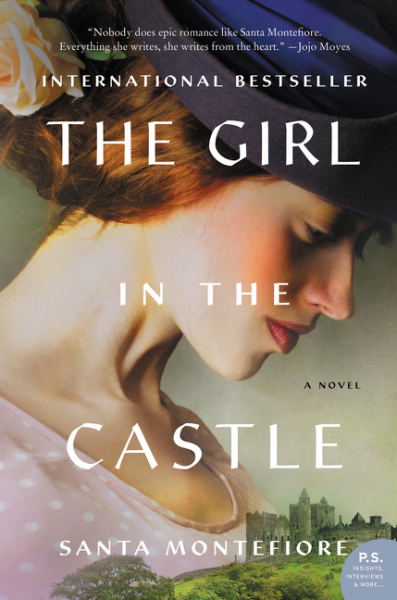 THE GIRL IN THE CASTLE tells the story of three very different women who lived in Ireland in the early 20th century. This novel focuses primarily on Kitty Deverill, who lives in a castle in West Cork, Ireland, as her family members have done for years. She is the youngest of four children and her mother wasn't particularly happy for her arrival. As a result, she is very close to her grandmother, a special woman who, like Kitty, has the special gift of seeing the ghosts of ancestors that resided in the castle. Kitty's family is Anglo-Irish and very wealthy. This proves to be an issue because Kitty's two best friends are Irish Catholic; however, Kitty considers herself 100% Irish. She enjoys the company of her best friend Bridie, the cook's daughter, and Jack O'Leary, the town vet's son. Eventually, she and Jack fall in love despite their different backgrounds and the problems that will follow. As Jack becomes more involved with the Irish revolt to throw over British rule, Kitty wants to help the cause. Despite her background, she ends up running messages and weapons to the rebels; however, some in the resistance resent her and her family. Her home comes under attack as does Kitty's own life! The novel also explores Bridie, the young girl who is best friends with Kitty despite her modest (and Catholic) background. Brodie is a loyal friend to Kitty but has always longed for the wealth and glamour of Kitty's life. When Bridie discovers that Kitty has feelings for Jack, she feels especially betrayed. She ends up turning to a much older man for comfort, and Bridie finds herself in serious trouble. Bridie eventually ends up heading to America for a job with a crochety old woman! And finally, to a lesser extent, the novel follows Kitty's English cousin Celia. Celia definitely had a role in this story as she tried to find an acceptable husband for marriage; however, I suspect that she will have a much larger role in the next novel. One thing I really liked about THE GIRL IN THE CASTLE were the characters. I especially enjoyed seeing how these women grew from young girls to mature women. It was interesting to see how their lives were affected by things outside of their control and how they managed to deal with these problems. In particular, I loved Kitty. At the beginning of the novel, I could tell that she had great qualities, yet I felt sorry for her because her parents weren't exactly hands on. Thank goodness she had a terrific relationship with her grandmother... who was another wonderful character. As the novel progressed, Kitty's strength and loyalty were tested and she definitely lived up to what I expected. Another great thing about this novel was the setting. It's Ireland for goodness sake! I mentioned this yesterday, but I really appreciated the author's ability to bring Ireland to life for the readers. I visited this country two years ago and absolutely fell in love with it. It truly is so beautiful and so green, and I thought Ms. Montefiore did a wonderful job of describing its beauty and rich history. She even managed to include some of the Irish folklore which is such an important part of the culture. I also liked that the book told the story of how the Irish fought for their independence from the crown. I've been interested in this topic ever since I read TRINITY back in college, and I appreciated that it was covered in this novel. It's a small gripe, but I kind of wish there had been even more details about the fighting. It really is a fascinating period of history. I do think THE GIRL IN THE CASTLE was a good pick for a book club discussion. I wasn't able to find a discussion guide, but our group tends not to use one anyway. We managed to discuss a few things like the characters' traits and the way the book ended; however, I think we could have delved more deeply into the topics of Irish history and culture as well as the themes of friendship, loyalty an love. Overall, I enjoyed THE GIRL IN THE CASTLE and I think I'll pick up the next book in the trilogy when it's available. I recommend this novel to fans of historical fiction as well as readers who enjoy books that take place in Ireland. The fact that you're interested in the next book in the series says a lot.